Oh my goodness. The feedback I received from my newsletter subscribers was overwhelmingly helpful! Last week, I asked each of you what would help you to not only learn and feel empowered through these weekly meal plans, but also motivate you and compel you to take more direct action in your own life! I am so grateful for the insights you shared and look forward to including each of your feedback in the coming weeks and months! If you aren't yet a weekly subscriber, click here to sign up. You will get these meal plans direct to your inbox every Friday, eliminating the need to meal plan on your own each weekend. What's more is every week, I breakdown the menu to share how we apply the "Love it, Like it, Learning it" approach each night. This means ONE meal for the WHOLE family, with there always being at least one item everyone enjoys. Yay for less meal time drama and no more facing the chronic dilemma of what to feed your picky eater. Join the growing community HERE. I heard from a lot of you a key priority for ready-made meals and/or items you could have on the table in under 30 minutes. So while a homemade, scratch-made meal is always nice, I can completely relate to how UNrelatable that is every night. That's why I will start to share a bit more about how I plan each week based on my own time constraints, knowing that many of you may have similar ones you struggle with. For this coming week, I have focused on super easy meals with little to no "recipe" required. I know for our family we will be out of town on a vacation and coming back to a whirlwind of real life - meaning no time to meal prep and playing catch-up upon our return, instead of starting next week "ahead of the game." So I need dinner ideas that are both healthy AND easy, but require little of me. A special thanks to each of the companies included for their delicious meal options this week! Do you use Love it, Like it, Learning it as a way to apply the Division of Responsibility in your home? What is a Division of Responsibility in Feeding? How to Establish a Division of Responsibility in Feeding? Or, feel free to download the free guide below for more info on how to get started with exposing your kids to their known favorites AND new foods, without a fight! Want to learn more about how "Love it, Like it, Learning it" works? Grab your free guide here. Oh baby! This download may be the mother load of Costco finds. With seven easy, on-hand, recipe-free meal ideas, these are some of the items I stock up on the most when I need meals with little to no effort. Being gluten-free, I rarely buy many of the premade meals at Costco in the freezer section. Besides many of them having a lot of added ingredients I wouldn't usually use, they rarely fit my dietary restrictions. That said, I have paired several ideas here that make for quick and easy meals you can cook and assemble into a complete meal in this download. Rarely is buying pre-made as healthy as homemade. At certain stores you are able to control what items and ingredients you buy a bit more (like specialty natural foods stores), but Costco has fewer of any given item to choose from. So while I think these are healthier, quick dinner ideas than hitting most drive thru on the way home after a long day, I wouldn't encourage these in exchange for all home-cooked alternatives where ingredients are more natural and there are less additives like sugar, salt, and in some items included, preservatives. 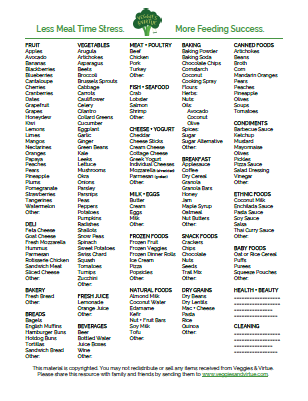 Use your discretion and include these as easy, occasional items compared to your everyday recipe rotations. Try to buy only what you know you will eat. In this week's download, I included a full week's menu to give you seven complete dinner ideas. Please note though, never have I bought all of the items at once. Not only would this be expensive, but you would likely end up with a lot of food waste from excessive food bought that goes uneaten. Since Costco is able to keep unit prices down by being a wholesale distributor, think through if and how you can eat up the larger package of any given item before it will expire (especially for more perishable items that you can't freeze or store in the pantry for later). Consider this: buy a few items that freeze well so you can keep them on hand for quick meal ideas. For perishable items, limit only to what you might buy. Balance your spending. While Costco can lead to some great savings when you break the items you would otherwise buy more often in smaller packages, rarely can you find anything under $5 there. Toss 20 items in your cart and it is easy to rack up a grocery bill of $200-300 per trip if you aren't careful. That's why it is key to learn your costs. Some items offer considerable savings compared to buying an equivalent item and amount at your other grocery store. Some items however, are packaged purely for convenience more so than cost-savings. So be sure to off-set the amount you spend on a Costco haul (likely being more than what you would usually spend) when you make smaller runs each week to another grocery store. You don't have to have a Costco membership to shop there. Instacart will go and get what you need from Costco without you having to be a member! This is also a great option for new moms or moms who need a grocery run done, but who can't physically make it to the store themselves. On week's like this, the ready made menu shared here and a grocery-delivery option like Instacart can be a huge saving grace to moms who need a helping hand. Even on week's like this when the menu is super easy and effortless, I love to pre-wash my produce for anything that I buy. Ideally, I buy any item on the dirty dozen list organic. Sometimes though, especially when shopping at Costco, it either is way to expensive in comparison to conventionally grown, or it is of lesser-quality or completely out of stock. In such instances, I use a 3:1 vinegar:water rinse. While this isn't as ideal as buying my produce organic (since it only cleans the outside residue on produce and can't address any issue of what the produce absorbed during it's growth cycle in conventionally treated soil and fields), it is a better way to wash produce than water alone. I use white vinegar and buy this at Costco, along with the other items on the list. It is the least expensive type of vinegar and in a large, Costco-sized container allows me to fill a clean sink with plenty of water and vinegar, at the right ratio, to wash away unwanted grime on my produce. I shared on my Instagram stories last week a shameless request to PLEASE like, share, and engage with these meal plan posts. I promise you I hate asking as much as some of you may like being asked. That said, I put a lot of time and energy into making these FREE for you and especially with the upgrades available to subscribers. The more you like, follow, share, and engage with these meal plans, the more I am able to keep creating and sharing them each week as a free service to each of you.